Is Wikilink Jacker a Scam or Not? If you have somehow been desperate enough to search for Gray Hat or Black Hat SEO techniques, then you must have come to know about this new tool called “WikiLink Jacker“. And you must have been thinking if Wikilink Jacker is a scam or not. Well though this question has lot many aspects to it but lets discuss some of them here. So what is Wikilink Jacker? Wikilink Jacker is a software tool that lets you find dead links on Wikipedia. Dead links of Wikipedia are citations of the content that are anchored to a page that is no longer in existence. Though these linked pages may have been in existence at some point in time but now show a 404 page not found error. Wikilink Jacker would allow you to search by a keyword that describes your page and then would show you a long list of wikipedia pages related to that keyword. And all these pages would have dead links. Then the software would sugest you to replace thosse dead links with a link to your page and claims that it all will work perfectly and increase your ranking on search engines. So is Wikilink Jacker a Scam? Well this might not be a million dollar question but sure is a $67 question. That might not look like a very big amount of money considering all the SEO projects for which you could use them. But what if all that this software claims is not true and you have got a $67 of nothing. So, it is a Big Question. But to not be a scam this software should be able to do all that it claims. So to test it we thought that we would try doing what this software does ourselves and tell everyone whether its worth your time and money. What we did was we searched for some keywords on google with the keyword “dead link” concatenated to our keywords, and we got some results and then created a Wikipedia account to replace 10 of those dead links with one of our demo site’s links. And this is what happened. Four of those edited links were replaced by previous dead links within 24 hours by other wikipedia users. It must be noted that wikipedia stores edit history and any change that you make can be undone by other users. But we still had 6 more backlinks links remaining until 5 more were removed within next 48 hours. and only two were still left. The one nice thing to note here is that these two links had a text less related to our actual keyword than some of the deleted links. Guess these were less famous articles on Wikipedia having less people interested in editing. So, the first claim that Wikilink Jacker makes is to help you create backlinks can be considered to be 20% right. But the remaining 2 links also were also did not have the best keywords that would describe the context of our demo website. But do backlinks from wikipedia help? If you think that you will find a black hat or so called gray hat SEO technique and it will work forever than you are just foolink yourself. Its just about time that Google makes changes to their ranking algorithm to tackle this prevalent black hat SEO. Yup! black hat it is. If its not genuine SEO than it has to be black hat. And it is quite possible that Google penalises these backlinks with decreased ranking as they have done in past, see this page. And recovery from such penalties can sometimes take a longer time than you can bear. If you are using a prevalent Black Hat technique, then quite possibly, so are your competitors. As more and more websites use these backlinks, more it is possible that Google may decrease the value of Wikipedia citation backlinks. The least you can hope is that if there is any penalty ever for these fake backlinks, then it will be there for your competitors too. The subheading of Wikiink Jaacker’s website is “the 100,000/mo visitor backlink formula“, they say that you will get what they call “High Quality High PR Links” and they claim to give you such high ranking in “As Little As 24-Hours“. Any experienced SEO expert would know how over-hyped all these three claims are. A software that cannot do what it claims to even a fraction is nothing more than a SCAM! 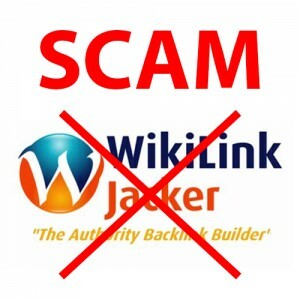 So, the fact is that Wikilink Jacker is a SCAM! Go for genuine SEO strategies. Be honest with your clients about the long time an SEO strategy can take to show good results. This way your clients will give you enough time to target robust SEO strategies that can never be penalized and give long lasting positive results. And you will not be tempted towards the non-reliable back hat SEO techniques and their short-lived results. There are other ways to target increased ranking like offers, discounts and attractive content that people are searching for. Relevant content is the most important factor in SEO as is claimed by Google itself.